There are products in the grocery store that make me shake my head and wonder why. Gallons of unsweetened tea is a product I just don’t understand. Some things are so simple to make, tea, even iced tea would be an example of a product that is very simple to make. To make tea you need some tea, boiling water, and 2 minutes for the tea to steep. You can even purchase cold tea bags that you don’t even need to boil water, and then let the tea steep. I know people that purchase pre-made tea on a regular basis, and I can’t help to ask them why. There really are advantages to making your own tea, if you like it stronger, you will add an extra bag or two to the water as it steeps to make it extra strong. Maybe you like tea that isn’t so strong so you would add some additional water to the tea to make it less strong. By making your own tea you are drinking tea that hasn’t been made shelf stable with preservatives to keep it from fermenting. It also costs pennies, yes, pennies to make your own tea at home. 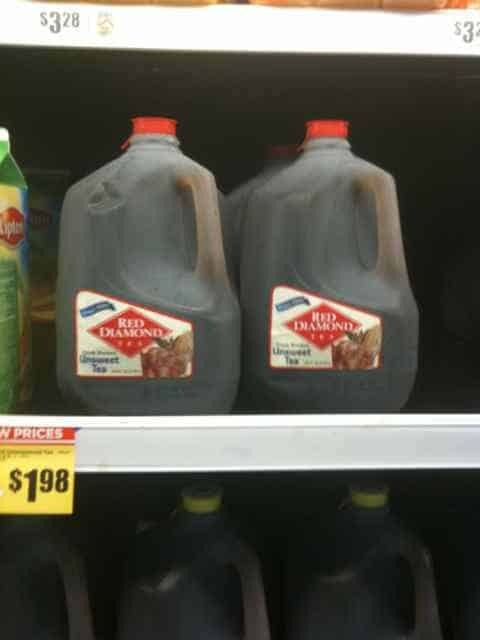 I understand that sometimes you may have a picnic and you may want to bring a gallon or two of this pre-made iced tea. I understand that if you are going to a potluck dinner you may want to bring this to drink. Why would you buy this as a regular grocery store item? I want to cry out to people, please, make some iced tea, it isn’t difficult to do. Place tea bags into the 2 cups of boiling water, and allow to steep for 2 minutes. When tea is done steeping, remove bags, and pour tea over ice. Folks, that’s it. You may make your tea differently, the folks at TeaGschwendner told me to make iced tea like this about 2 years ago, and I found that my tea tastes best when made like this. I also like to use loose tea when I can, but honestly plain old bags of Lipton, Tetley, or any other brand of tea bag is far superior to what you can buy in a plastic jug. I am sure I will continue to roll my eyes when friends of mine purchase these jugs of swill. We will continue to have this conversation, I will offer to make them tea, and I will be turned down. If you have never made tea before, please, please give it a try, I promise, it is cheaper and tastes better to make your own fresh tea. Great point. For about 8 months I lived in an area where I had water delivery. My well had water that was safe but smelled bad, and it wasn’t pleasant at all.